You’ll want to see what’s available on consignment at Vintage La Conner. Are you looking for a special gift for a friend, bride-to-be or yourself? Are you thinking of consigning one of your own no-longer-wanted treasures? Whatever your interest, we’d love to see you. 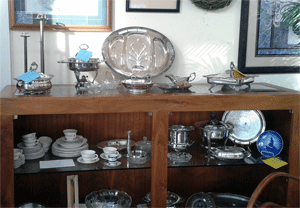 We accept and sell furniture and finer decorative items such as the antique silver and fine china shown here (visit our Consignment page for more details on how and what to consign), and stop by our store at Third and Morris streets in La Conner to find just what you’ve been looking for.